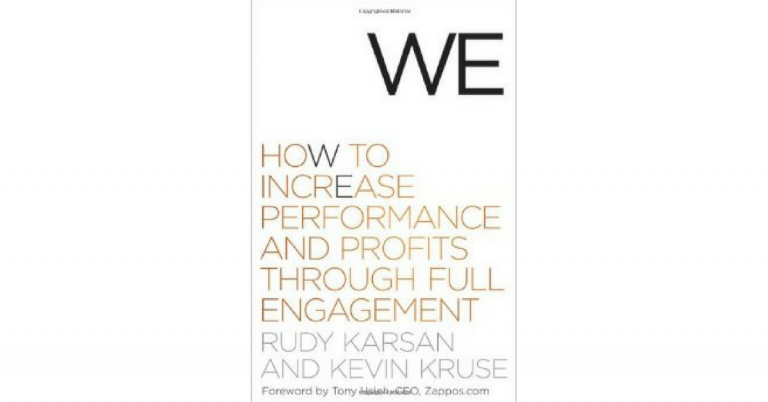 We: How to Increase Performance and Profits through Full Engagement is so titled because the authors view employee engagement as a partnership between employees and their employers. I couldn’t agree more. Early on in the book though, there is a part with which I disagree: the authors strongly argue that paying for performance is key to employee engagement. The research summarized in Daniel Pink’s book Drive suggests that paying smart people for their performance – at least in the short term – backfires and leads to reduced performance. A caveat here is that the research Daniel Pink quotes focuses on the short term. I have hunted extensively for data on how performance incentives work over the long term, a year or more for example, and found nothing. I’ve asked professors who say they don’t know of any data either. If anyone reading this has that data, please share! Until then, I would urge extreme caution before applying the authors advice to pay in advance for performance. Later the book moves into much more valuable territory, including the concepts of growth, recognition, and trust, the authors’ keys to employee engagement. Employees are more engaged when they feel they have growth opportunities in their careers, are recognized for the good work they are doing, and trust their senior management, colleagues, and especially their boss. This is a valuable book for those who want to dive deep to learn more about employee engagement. If you are looking for a short introduction to employee engagement, I’d suggest Kevin Kruse’s other book on engagement first. As always, I am curious to hear your thoughts on the book, and on the question of pay for performance. Please leave your comments below! ← 3 habits that deteriorate your mood at work – and the hacks to counteract them.